Safe monitoring of machine positions, e.g. when robots are used. 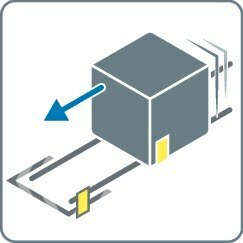 Safe monitoring of machine end positions. Safe position monitoring of steering axes and swivel arms. e.g., to control monitoring fields of safety laser scanners on automated guided vehicles for speed shifting. Combination of protection for machines and persons can be realized.